Landing - Power On of Off? "When landing, which is best - power on or power off approach? I suppose that answer will vary depending on the type aircraft, and possible other variables as well." - Doug R.
"You are correct; the use of power on the approach depends upon the type of aircraft. Some of the heavier airplanes develop rather high sink rates with no power on the approach. In light airplanes such a J-3 Cubs and Champs, power off approaches are desired. A good pilot needs to be flexible enough to do both as conditions dictate. 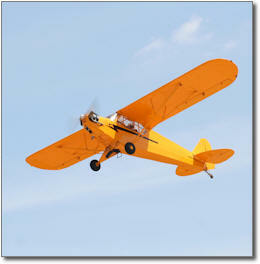 The heavy airplane might have to do a power off approach someday and the cub pilot may have to extend his pattern. I encourage all pilots I fly with to practice power off approaches from time to time. Some pilot's worry that doing this can be bad for their engine due to rapid cooling. True, rapidly closing the throttle when the engine is hot from a period of high power can cool it too fast, but if one is planning a power off approach, it is easy to arrive at the downwind with the engine already relatively cool. Then you can slowly close the throttle. Since you are already near your approach speed, the cooling that occurs is not much different than it is after landing. If a person practices power off approaches on a regular basis, they will be prepared if they actually have to do it someday."